On December 27, 2012, the Bridgepoint Education Holiday Bowl festivities kick off with the free and family friendly Port of San Diego Big Bay Balloon Parade at 10:00 AM. The excitement continues later that evening when the UCLA Bruins take on the Baylor Bears at Qualcomm Stadium. Which team are you rooting for, UCLA Bruins or Baylor Bears? 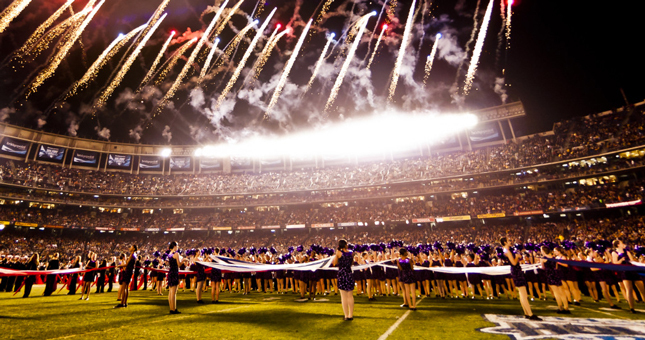 Tell us in the comments below for your chance to win two (2) tickets to the Bridgepoint Education Holiday Bowl at 6:45 PM on December 27, 2012 at Qualcomm Stadium in San Diego. Leave a comment below on which team you are rooting for in the Bridgepoint Education Holiday Bowl. Duplicate entries will be filtered out and discarded, so adding additional comments won’t increase your likelihood of winning. Winners will be chosen randomly. One winner will receive a two (2) tickets to the Bridgepoint Education Holiday Bowl on December 27, 2012. If you are chosen, you will be notified by email. Winners must respond within one day of being contacted. If you do not respond within that period, another winner will be chosen. Entries (comments) can be submitted until December 14, 2012 at 10:00 AM PST. Good luck! This entry was posted in Golf & Sports and tagged bridgepoint education holiday bowl, college, contest, football, giveaway, San Diego, tickets by Brent Bernasconi. Bookmark the permalink. Our son played high school ball with players on both teams. What a great game to watch! Hope he gets the opportunity! Congratulations Jim Files for winning two tickets to the Bridgepoint Education Holiday Bowl! Have a great time! As an Aztec for Life I cannot possibly support those schools in LA therefore Go BAYLOR!!! Holidays are filled with Baylor green and gold and it is only natural that the green and gold shine bright at the Holiday Bowl as Baylor beats UCLA!! Go Baylor!! I want UCLA to win, and I PROMISE to post score updates and “live from the game” photos to the Visit San Diego FB page to share with al the followers. Rooting for the Bruins! Go UCLA! Bruins baby! Ucla and San Diego, a winning combo! …always root for the SoCal teams…. Go UCLA!! for my husband and son!!! A great christmas present for my Father and Brother would be these tickets and a BRUIN victory. Go Bruins! Love going to UCLA games, nothing better!!! Oops, SFSU. I could have driven to UCLA every weekend, if it was SDSU. Wishful thinking. I <3 UCLA! Go Bruins!!! Rooting for my alma mater…UCLA! Go Bruins! be, our love will not grow old. a man from USC, every Bruin starts to roar! U. C. L. A FIGHT, FIGHT, FIGHT! Congratulations Jim! You’ve won two tickets to the Bridgepoint Education Holiday Bowl! Go Bruins!